Every company relies on how its users react to the services they provide. As they say, customers are the heart of every business. That's why every company is always looking for talented individuals to join them - people who are willing to grow, learn and have the capabilities to provide solutions to the needs of their customers. Thank you for joining us and for showcasing your capabilities and skills during our Amsterdam Tech Job Fair yesterday. Yesterday's event was our way of helping you get your dream job by meeting your potential employers in person. Altius was one of those potential employers. If you failed to meet them in person yesterday, you might want to know more about them and find out if they are still hiring. Altius is helping businesses to harness their data and use it to understand, model and predict business performance – delivering improved engagement, efficiency and profitability. Their vision is to design innovative solutions that transform the way people use data and that set new precedents within the industry. They also set out to develop a culture and team of like minded people – personable professionals, who are at the height of their game but are equally passionate about developing close client relationships. Altius is bringing together the technical, architectural, business and sector expertise where you can work with senior decision makers to understand their current business state and the challenges that the organisation faces in improving performance. They develop a detailed roadmap for a transformation project focused on capturing and utilising digital data to improve business intelligence and empower the organisation to drive growth. This company empower data-driven decisions for some of the world’s leading brands. They are extremely proud of their success and the reputation for setting the standard within the industry. They have ambitious plans for growth. Altius relies on two things for success: cutting edge technology and talented people. To accommodate their growth, they are looking for exceptional talent in data strategy, data platform, business intelligence, analytics, data science and managed services. You might be really wondering why you should choose Altius? Reputation - They are the market leader in Microsoft Azure-based data platforms, and their data science team is recognised for its cutting edge work in delivering machine and deep learning solutions. From an average annual growth of 40%, it increased to a staggering 72% in 2018. People - Their non-hierarchical structure means your voice will be heard and your opinion valued. To thrive in their team, you should be interested in data – the factors that drive business performance and problem-solving. Projects - Their impressive client portfolio include some incredibly exciting projects for global and big-named brands across multiple industry sectors, including leisure and hospitality, travel and transport, manufacturing, retail, finance and insurance. Progression/recognition - They've created a stimulating, supportive and rewarding environment where autonomy in each role is valued and actively promoted. Social - It’s not all work, work, work. For fitness enthusiasts, they offer a running club and yoga sessions as well as a monthly table tennis tournament and more. Early careers - Their collaborative working culture enables talented individuals to develop personal and professional skills whilst being closely trained and mentored. Visit them on their website, Twitter and LinkedIn for updates. 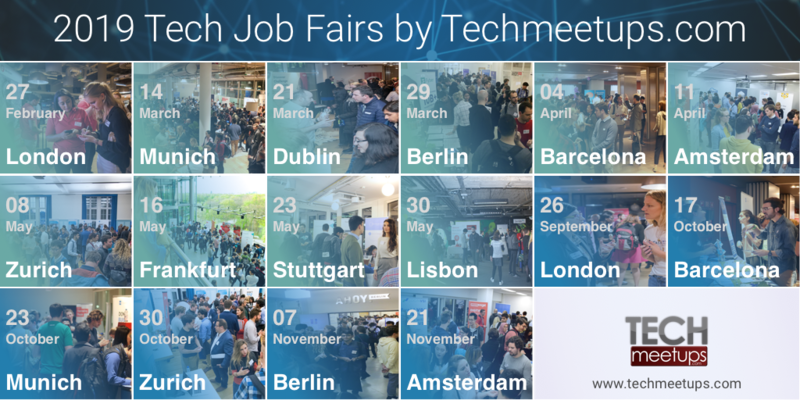 Thank you for making our Tech Job Fair in Amsterdam a total success!